Smart food packaging is important to the food industry and instant food. Currently, firms in developed countries have improved various packaging technologies to fit with the applications to comply with the lifestyles of consumers and meet with the new standard of environmental friendliness regulations. In Thailand, the food packaging industry has to develop packaging technology to be competitive in terms of innovative technology and suitable applications to support both domestics and export sales. Entrepreneurs need to be alert to continuous development the capabilities of manufacturing, availability of technology and collaboration in research between the public sector (research institutes and universities) and the private sector (food manufacturing firms and packaging manufacturing firms). However, the applications of smart technology food packaging are related to major investment and a high degree of uncertainty whether it will be a success in the market or not. Therefore, the decision to select any advanced technologies is important and needs to identify a lot of factors affecting selection. Those factors cover with technology aspect, marketing and business competition aspect, financial and economic aspect, and strategies, society and the environmental aspect. There are at least two factors driving new technology in the food industry such as Research and Development (R&D) activities, and market orientation . Packaging R&D is considered as the key factor driving technological change in the food industry, which is closely linked with innovational industrial stings, and technological change is a necessary condition for innovation in the firms [5, 6]. Technological change can be achieved through investment in the technological and scientific capabilities of the workforce . Product technology capabilities are needed for successful innovation. Market orientation may be defined as the detection and fulfilment of needs and wants of potential customers using the skills, resources and competencies of the company . Future trend in the food packaging technology includes of several technologies, for example, high barrier materials, nanotechnology, and improving of convenience features of packaging related to production, distribution, sales, marketing, consumption, waste disposal, food safety, environmental friendliness and smart packaging [9, 10]. Advanced food packaging technologies are based on the packaging that has various functions in protection, convenience, communication and containment . Moreover, trends in food packaging also cover about the sustainability of packaging, taste and healthiness to food, consciousness and demand from consumers’ side, and conveniences in usage . Active packaging is the incorporation of specific substances into packaging systems to maintain or extend the food properties or provide information of packaging environment and food status to the processor, retailer, consumer . The primary active technologies mostly enhance the shelf life of the products, although active packaging may perform other functions as well. There are many applications of active packaging such as absorbers and emitters of gas and volatile substances, antimicrobials, and antioxidants [14, 15]. Absorbers and emitters of gas and volatile substances are one kind of active solution. It aims to control packaging headspace composition during storage. These devices can be divided into two main categories: scavengers or absorbers and emitters. The term scavenger is usually applied to fast-acting substances, able to intercept gaseous or volatile compounds and react chemically with them. The term absorber can be used when the reaction between the gas and the active substance is based on the physical mechanism of absorption during which molecules enter some bulk phase usually made from a solid material. Examples of compounds with absorption function are activated carbon and other molecular sieves. Oxygen, carbon dioxide and ethylene are gases that differently affect the shelf life of some food and, for this reason, a large number of active solutions exist based on their ability in removing or releasing these gases . Antimicrobial active packaging has significantly increased during recent few years as an alternative method for controlling microbial contamination of food based on incorporating antimicrobial substances with inherent antimicrobial properties in or coated onto the packaging material to reduce or inhibit microbial growth [17, 18]. There is a difference between the antimicrobial solution formulated to preserve and extend shelf life and, those able to target specific pathogenic species. The antimicrobial activity may exist in the packaging material, in direct contact with the food surface, or in the package headspace, depending on the volatility of the substance. Incorporation methods and transferring/ releasing techniques are critical in designing an effective antimicrobial packaging system . Oxidation of lipids in the food causes a reduction in shelf life due to changes in taste and odor, tissue disruption, and reduction of food functionality and nutritional quality. Food oxidation can be avoided by using oxygen holders or antioxidant substances in the packages. This type of packaging is designed to slow down or prevent the oxidation reaction that influences food quality . Active packaging represents an innovative strategy to incorporate antioxidants in a polymer to prevent oxidative processes and extend the shelf life of the food product. Antioxidant agents can be applied into the packaging system in different forms such as sachets, and labels, coating or immobilization on the packaging material surface, incorporated into the polymer matrix, multilayer films, etc. . Sensors: Sensors which are applied in food packaging display the freshness of the food, microbial spoilage in products (if any), oxidative rancidity, and changes depending on temperatures. When sensors are integrated with the food packaging, good chemicals, pathogens and toxins can be determined. Some examples of this are gas sensor packaging, biosensor packaging, etc. Indicators: For the period when food is in the package, various indicators for features such as temperature, microbial disruption, packaging integrity, physical shock, and originality are functioning. While some of the indicators get in reaction with the food, some of them can provide information without getting into any reactions. Leakage Indicators is the system showing the existence or lack of certain gases and provides information about package integrity and leakages. Leakage indicators change color as a result of chemical and enzymatic reactions. Indicators can be in the form of tablets, labels, and printing and they can also be formulated by coating the polymer film. Freshness indicators give direct immediate product quality information resulting from microbial growth or chemical changes within a food product. Microbiological quality may be determined visually through the reaction between microbial growth metabolites and integrated indicators within the package. Freshness detectors are used for determining carbohydrate diacetyl, amine, ammonia, and ethanol, all of which are in the packaging. They are systems that work for determining the metabolites and the change has concentrations as a result of the violation of required conditions in the storage of food and due to the microbial disruption [19, 22]. Freshness indicators can also be used to provide an estimate about the remaining shelf life of perishable products. Time-Temperature Indicators (TTI) is a device to imitate the change relating to a food product being subject to the same temperature, as within a specific quality parameter. Time-Temperature indicators show the temperature applied during distribution with color variations with respect to mechanical, chemical, electro chemical, enzymatic, or microbial changes. Time-Temperature indicators are labels that are prepared for providing continuity of food safety and quality and for monitoring the temperature changes in the distribution and storage process . There are other intelligent packaging technologies that do not fall into either the sensor or indicator classification. Radio Frequency Identification System (RFID) is grouped under the term automatic identification, together with barcodes, QR-codes, magnetic inks, etc. . RFID is a system that allows identification with radio waves while providing opportunities for remote monitoring of the product. The final benefits of RFID in food packaging are speeding up the stock turnover and improving monitoring. By establishing the RFID system at the markets, information can be automatically reached with respect to the number of products remaining on the shelf, quantity of stock in the warehouse, products themselves, the shelf lives of items near expiry, and whether products are preserved under correct temperatures or not . Another consideration is environmentally friendly packaging. An important strategic issue facing the food industry is the political and public pressure over the environment, particularly in relation to concerns over the amount of packaging and packaging waste. Environmental policy on packaging should focus on resource efficiency and not just waste and recycling . Since it is the psychological process in decision making. Consumer decision is another factor to be considered about. Socio-demographic factors such as income, racial profile, presence of children; education level and age have significant effects on the demand for functional enhancements . Moreover, the packaging, price and brand image are the primary characteristics that affect consumers’ decision especially in some kinds of products like milk [24, 25]. According to technology availability, the trend of food packaging technology can be summarized as shown in Fig. (1). The growing urban lifestyle of consumers in Thailand has been driving demand for packaged convenience food items. Convenience stores are gaining importance for Thais amid the urbanization of the country and are looking at the growing demand for convenience in the south-east Asian country. At present, Thailand has recognized the importance of the development of food packaging in terms of creative packaging. The National Innovation Agency of Thailand, in 2010 and again in 2013, expressed concern with three components: functionality, emotional consideration and materials. This includes packaging that is designed by applying any one of these components to emphasize on the usability such as active packaging, intelligent packaging and biodegradable packaging made from bioplastics [26, 27]. 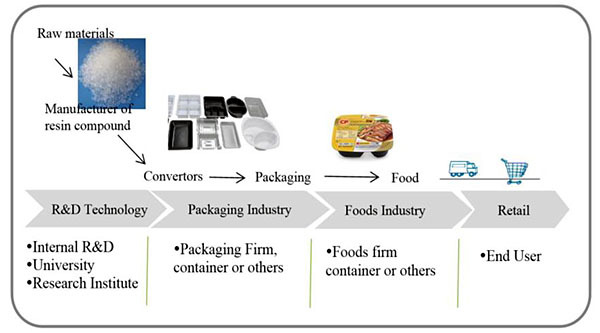 The pathway of food packaging technology in Thailand is shown in Fig. (2). Hence, this paper aims to identify and validate the factors in selecting smart food packaging technology of food packaging firms from their viewpoints and their decision insights. Firstly, the author reviewed the literature to find out general factors in selecting any technologies to set guideline for design questions in questionnaires about decision factors in selecting food packaging. Questionnaires are designed by using five points Likert scales to ranking the degrees of importance of those factors in respondents’ opinions. Secondly, by purposive sampling technique, sample groups are 40 leading firms who participated in a seminar of the National Food Institute of Thailand in 2015. Questionnaires were distributed to them to find out their concerned decision factors. Collected data were analyzed by using average points of each factor. Fig. (2). Pathway of Food Packaging Technology. By the facts that the development of smart packaging in Thailand is mostly driven by only large firms. Hence, thirdly, the author performed in-depth interviews with executives in 8 leading and top largest food firms in Thailand to confirm that advanced packaging technology whether has opportunities of growth in the food industry in Thailand or not. All of them were considered innovators or leading food firms in the food industry, government agencies, and universities in Thailand. The interview questions were open-ended questions focused on the strengths, weaknesses, opportunities, and threats of using new packaging technology. Interview duration was once for around 60-90 minutes. After that, the author summarized the main ideas of the answers received. The results of interviews were analyzed by using a SWOT analysis for assessing the situation of business operation on new technology. The factors for selecting the new food packaging are summarized in Table 1. Table 1. Factors of selecting smart food packaging. perform consistently under specified conditions. Results from questionnaires surveyed with 40 firms in the food industry in Thailand revealed that the firms considered factors in four areas including technology aspect, marketing and business competition aspect, financial and economic aspect. 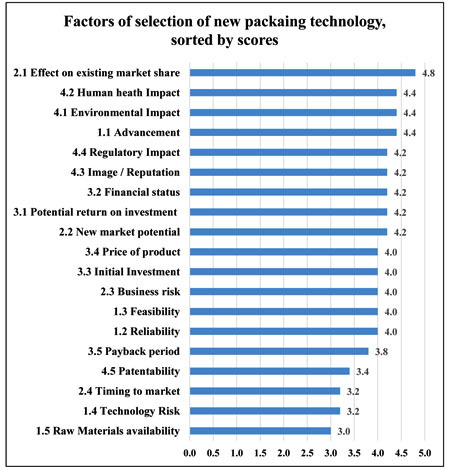 The overall average scores of 19 sub-factors in four main areas that influence the selecting of the packaging technology were between 3.20 - 4.60 points from 5 point scale. The most concerned factors by firms are “Effect on ex-isting market share” factor with the highest score of 4.8 points. 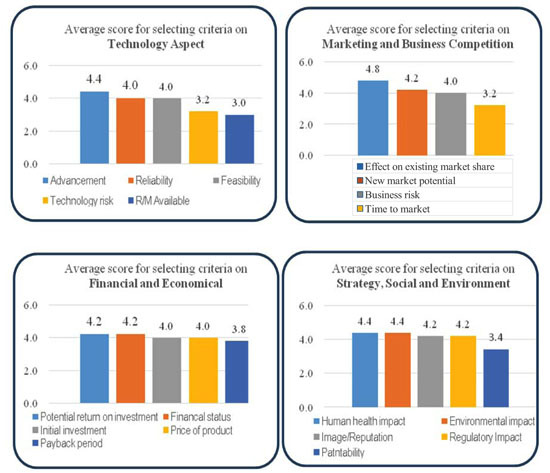 The second most concerned factors by firms are “Human health Impact”, “Environmental Impact” and “Advancement” factors with equal score of 4.4 points. The third most concerned factors by firms are “Regulatory Impact”, “Image / Reputation”, “Financial status”, “Potential return on investment” and “New market potential” factors with equal score of 4.2 points. From technology aspect: the most important factor is “advancement” of technology with 4.4 points, followed by “Reliability” and “Feasibility” factors with equal scores of 4.0 points. The less important factors are “Technology risk” and “Raw material availability” factors with 3.2 and 3.0 points, respectively, as depicted in Fig. (3). From marketing and business competition aspect: the most important factor is “Effect on existing market share” of technology with 4.8 points, followed by “New market potential” with 4.2 points, “Business risk” factors with 4.0 points. The least score of “Timing to market” is 3.2 points, as depicted in Fig. (3). From financial and economic aspect: the most important factor is “Potential return on investment” and “Financial status” with an equal score of 4.2 points. It is followed by “Initial Investment” factors and “Price of product” with equal score of 4.0 points. The least important factor is “Payback period” with 3.8 points, as depicted in Fig. (3). In strategy, social and environment aspect: the most important factor is “Environmental Impact” of technology and “Human heath Impact” with equal score of 4.4 points. It is followed by “Image / Reputation” factors and “Regulatory Impact” with equal score of 4.2 points. The least important factor is “Patentability” with 3.4 points, as depicted in Fig. (4). Fig. (3). Average scores of each sub-factor for selecting smart food packaging. Fig. (4). Average scores of factors for selecting smart food packaging. Table 2. SWOT Analysis of interview results about the selection of new packaging technology. In facts, development of advanced technologies in Thailand are driven by large firms in the country only. Meanwhile, most of the food firms in Thailand are small and medium-sized enterprises (SME) (around 80-85 percent). Thus, they rarely have the ability to access resources, investment and technology to use the new technology as same as the large firms. Smart packaging for food is a global issue and there are a lot of research studies about such issue. It seems that knowledge and technology will be transferred from developed countries to developing countries. In Thailand, there are efforts to provide the opportunity for technology transfer from research to the industry by the private sector. Funding to support the research institute are mostly from a government project. Results from the interview from executives in 8 leading large food firms in Thailand are summarized in Table 2. The findings of the current study supported that the most important factor is “effect on the existing market share”. It implied that whenever smart packaging is applied in Thailand, the firms are still concerned with the existing market, so it should not adversely impact the existing market. Human health impact factor and environmental impact factor are the next concerned factors which mean that in the food industry in Thailand, the attributes about health and environment are interesting issues for the customers. Then the producers have to be concerned about them in high priority. The factors about marketing and business are quite important. While the technology and raw materials seemed to be less concerned. It may imply that the technology for food packing in Thailand are prompted to implement in the industry whenever the marketing opportunities permit. Also, the raw material for food packaging seems to be adequate or not to trouble in consumption. The result of this research can support entrepreneurs who want to develop packaging in their own organizations by the decision factors and support the overview information of smart food packaging to adjust the strategy in their organizations. The psychological behavior of the decision in the selection of smart packaging in the producers’ viewpoint or manufacturing firms is that they are vigilant in select new technology. Most of the large firms may use wait and see strategy to see whenever market demands or consumers’ demands reach out the large volume of market shares. They do not take the risk to be the first mover in selecting new food packaging technology until the situation is good enough. For the decision factors, the participants rated the four main aspects including the technology aspect, marketing and business competition aspect, financial and economic aspect, and strategy, society and environment aspect with different scores. The highest score of the sub-factors is “effect on the existing market share”. Human health impact factor, environmental impact factor and advancement of packing technology factor are concerned to be second important factors. Image / reputation factor, financial status factor, potential return on investment factor and new market potential factors are the next concerns to be important. The next concerns to be important are the price of product factor, initial investment factor, feasibility factor and reliability factors. The concerns to be less important are payback period factor, patentability factor, time to market factor, technology risk and raw material availability factor. From the interview with the firms, even though the food and packaging firms in Thailand are aware to develop new advanced packaging, however, the high cost of developing smart packaging is the obstacle to be transferred to implementation in the industry. The participants from government, universities, and the industry believe that the development approach for smart food packaging technology will be importing the technology and know-how from abroad into the country by only the leading big firms’. The results of this research indicate some similar and some different factors compared to the past researches. In similar way, this research revealed the important factors about human health impact and environmental impact that near to the result of factors that influence public acceptance of innovative technologies and products in the food area that mentioned that the important factors were perceived benefit and perceived naturalness are important factors for the acceptance of new food technologies. In a different way, this research revealed that in a specific country (Thailand), firms perceived the existing market to be more important factors. Since results of decision factors in this survey are independent of each other in the viewpoints of respondents. Thus, for future research, it should focus on the study of multi-factors e.g. the Analytical Network Process (ANP) tool, etc., to link the relationship of each factor. Furthermore, it may find out the weight of each factor. “This research was supported by research fund under THE 90TH ANNIVERSARY OF CHULALONGKORN UNIVERSITY (Ratchadaphiseksomphot Endownment Fund)”. Coles R. Food Packaging Technology 2003. Bindu J, Ravishankar CN, Gopal TKS. Packaging of retort-processed seafood, meat and poultry 2012; 333-62. Vanderroost M, Ragaert P, Devlieghere F, Meulenaer BD. Intelligent food packaging: The next generation. Trends Food Sci Technol 2014; 39: 47-62. Grunert KG, Harmsen H, Meulenberg M, Kuiper E, Ottowitz T, Declerck F, et al. A framework for analyzing innovation in the food sector.Product and process innovation in the food sector 1997. John EE. Policy implications of the innovation process in the U.S. Food sector. Res Policy 1983; 12: 239-67. Huiban JP, Bouhsina Z. Innovation and quality of labour factor: An empirical investigation in the French food industry. Small Bus Econ 1998; 10: 389-400. Leiponen A. Competencies, innovation and profitability of Firms. Econ Innov New Technol 2000; 9(1): 1-24. Grunert KG, Baadsgaard A, Harting-Lasen H. Madsen TK Market Orientation in food and agriculture 1996. Han JH. Emerging technology in food packaging: Overview 2005. Han JH. A review of food packaging technologies and innovations 2014; 4-11. Yam KL, Lee DS. Emerging Food Packaging Technology 2012. Kerry JP, O’Grady MN, Hogan SA. Past, current and potential utilisation of active and intelligent packaging systems for meat and muscle-based products: A review. Meat Sci 2006; 74(1): 113-30. Brody AL, Trupinsky ER, Kline LR. Active packaging for food application Technomic Publishing Company 2001; 218. Limbo S, Khaneghah AM. Active packaging of foods and its combination with electron beam processing 2015; 196-217. Dainelli D, Gontard N, Spyropoulos D, Beuken EZ, Tobback P. Active and Intelligent food packaging: Legal aspects and safety concerns. Trends Food Sci Technol 2008; 19: S103-12. Campos-requena VH, Rivas BL, Perez MA, Pereira ED, Garrido-miranda KA, Peraira ED. Polymer/ Clay nanocomposite films as active packaging material: Modeling of antimicrobial release. Eur Polym J 2015; 71: 461-75. Eker B, Icoz A. Smart, active and Sustainable food packaging 2017; 2nd International Conference on Quality of Life; June 2017; Center for quality, Faculty of Engineering University of Kragujevac 2017; pp. 293-301. Realini CE, Marcos B. Active and intelligent packaging systems for a modern society. Meat Sci 2014; 98(3): 404-19. Yam KL, Takhistov PT, Intelligent packaging JM. Concepts and applications. J Food Sci 2005; 70. Riva M, Piergiovanni L, Schiraldi A. Performance of Time Temperature indicators in the study of temperature exposure of packaged fresh foods. Packag Technol Sci 2001; 14: 1-9. Gulseven O, Wohlgenant M. Demand for functional and nutritional enhancements in specialty milk products. Appetite 2014; 81: 284-94. Wasana K, Manuspiya H, Chaisuekul C, Ploykitikoon P. Selection Criteria for Food Packaging innovation in Thailand. Int J Mecha Pro Eng 2015; 3(9): 61-5. Peelman N, Ragaert P, Meulenaer BD, Adons D, Peeters R, Cardon L, et al. Application of bioplastics for food packaging. Trends Food Sci Technol 2013; 32: 128-41. Rhim JW, Park HM, Ha CS. Bio-nanocomposites for food packaging applications. Prog Polym Sci 2013; 38: 1629-52. Shen Y, Chang S, Lin GTR, Yu H. A hybrid selection model for emerging technology. Technol Forecast Soc Change 2010; 77: 151-66. Shen Y, Lin GTR, Tzeng G. Combined DEMATEL techniques with novel MCDM for the organic light emitting diode technology selection. Expert Syst Appl 2011; 38: 1468-81. Choudhury AK, Shankar R, Tiwari MK. Consensus-based intelligent group decision-making model for the selectin of advance technology. Decis Support Syst 2006; 42: 1776-99. Ghassmi SA, Danesh S. Ahybrid fuzzy multi-criteria decision making approach for desalination process selection. Desalination 2013; 313: 44-50. Kengpol A, O’Brien C. The development of a decision support tool for the selection of advanced technology to achieve rapid product development. Production economic 2001; 69: 177-91. Shehabuddeen N, Probert D, Phaal R. From theory to practice: Challenges in operationalising a technology selection framework. Technovation 2006; 26: 324-35. Vats S, Vats G, Vaish R, Kumar V. Selection of optimal electronic toll collection system for India: A subjective-Fuzzy decision making approach. Appl Soft Comput 2014; 21: 444-52. Habib M, Khan R, Piracha JL. Analytical network process applied to R&D project Selection 2009; 274-80. Kandrick JD, Saaty D. Use Analytical hierarchy process for project selection 2007; 22-9. Kumar SS. AHP-Based formal system for R&D project evaluation. J Sci Ind Res (India) 2004; 63: 888-96. Mohanty RP, Agarwal R, Choudhury AK, Tiwari MK. Afuzzy ANP-based approach to R&D project selection: A case study. Int J Prod Res 2005; 43: 5199-216. Meade LM, Presley A R. IEEE Trans Eng Manage 2002; 49: 59-66. Coldrick S, Longhurst P, Lvey P, Hannis J, An R. D options selection model for investment decision. Technovation 2005; 25: 185-93. Lawson CP, Longhurst PJ, Lvey PC. The application of new research and development project selection model in SMEs. Technovation 2006; 26: 242-50. Rahmani N, Talebpour A, Ahmai T. Developing a Multi Criteria Model for stochastic IT portfolio selection by AHP method. Procedia Soc Behav Sci 2012; 62: 1041-5. Ma D, Chang C, Hung S. The selection of technology for late-starters: A case study of energy-smart photovoltaic industry. Econ Model 2013; 35: 10-20. Büyüközkan G, Arsenyan J, Ruan D. Logistics tool selection with two-phase fuzzy multi criteria decision making: A case study for personal digital assistant selection. Expert Syst Appl 2012; 39: 142-53. Hsu Y, Lee C, Kreng VB. The application of Fuzzy Delphi method and Fuzzy AHP in lubricant regenerative technology selection. Expert Syst Appl 2010; 37: 419-25. Amindoust A, Ahmed S, Saghafinia A, Bahreiniejad A. Sustainable supplier selection: A ranking model based on fuzzy inference system. Appl Soft Comput 2012; 12: 1668-77. Ávila P, Mota A, Pires A, Bastos J, Putnik G, Teixeira J. Supplier’s selection model based on an empirical study. Procedia Technology 2012; 5: 625-34. Amin SH, Zhang G. An integrated model for closed-loop supply chain configuration and supplier selection: Multi-objective approach. Expert Syst Appl 2012; 39: 6782-91. Davoudpour H, Rezaee S, Ashrafi M. Developing a framework renewable technology portfolio selection: A case study at a R&D center. Renew Sustain Energy Rev 2012; 16: 4291-7.